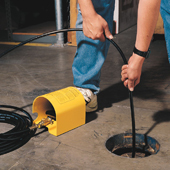 Accessorizing sounds like something you do with your wardrobe, but it holds true for your industrial pressure washer equipment as well. Why accessorize? To increase efficiency! The measurement, or ratio of input (time and knowledge) to output (performed task or profits), can be greatly increased by the right accessory. Whether it’s a telescoping lance that extends to those hard to reach places, a wireless remote that controls the pump, burner, and detergent from up to 300 feet away, a flat surface cleaner, hose reels, rotary nozzles, or options, we’ve got you covered. Give us a call to discuss ways to get more out of your pressure washer. 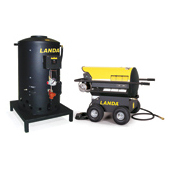 Landa Karcher Group’s Hose Reels make it easy to manage high-pressure hoses. 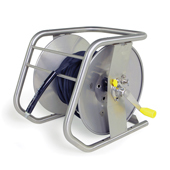 Engineered for extreme heavy-duty usage, these hose reels accommodate 100′ or 200′ 2-wire 3/8″ hoses with room to spare. Accessories available for easy stacking on cart for ease of mobility or fixed or swivel mounts. Water surface cleaners enhance your power washing effectiveness. The Water Jet is the premier surface cleaners on the market attaching easily to a hot- or cold-water pressure washer to “mow” grime. With its infinitely variable rotary bar adjustment, the Water Jet can clean a wide variety of surfaces from concrete to asphalt. 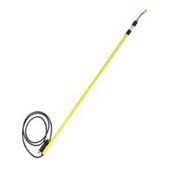 The Landa Karcher Group Telescoping Wand, Extend-A-Wand, is the premier telescoping wand in the industry with its many features. It’s built tough, yet light weight and ergonomically designed for hours of high-level cleaning without the hassle of a ladder or scaffolding. 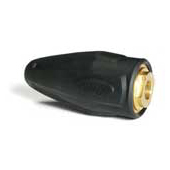 We distribute a broad selection of rotating nozzles. They clean faster and deeper than conventional high-pressure spray nozzles by combining the deep cleaning impact of a 0-degree nozzle with the broad spray pattern of a 25-degree nozzle. With cleaning action that’s both deep and wide, wash time and labor costs can be slashed significantly. Cleaning sludge from the bottom of a collection pit is neither easy nor fun. But the Pit Cleaner makes it bearable. 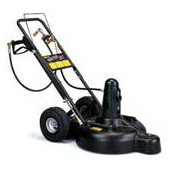 An extended wand is attached to a pressure washer, with a minimum of 1,000 PSI. The pressure is channeled so that it creates a vacuum capable of suctioning mud and sludge from the bottom of a pit or even a pond. The sludge is deposited into a porous collection bag, mounted on a hand truck, where the water drains out and the sludge is allowed to dry for eventual disposal. For the extra-tough cleaning tasks, wet sandblasting is the dust-free solution. Our sandblaster attaches to a hot or cold water pressure washer and, using a venturi, mixes in sand or other abrasive media with the high-pressure spray of the power washer to create enough cleaning power to strip paint off concrete or barnacles from a ship’s hull. 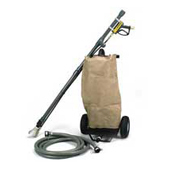 A variety of safety features, including a face shield, come standard with the sandblaster. 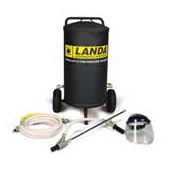 Landa Karcher Group heating modules are an accessory that turns a cold water pressure washer into a hot water pressure washer via a simple attachment. Heating modules are typically electric-powered, diesel or oil-heated and offer the added benefit of portability. Use a Landa Karcher Group drain cleaner for powerful sewer or pipe flushing. A jet spray nozzle, attached to the pressure washer and a special hose, creates a pulsating spray that pushes the hose down into the clogged drain or pipe. Some nozzles also rotate for additional agitation and even pipe surface cleaning. A covered, foot-controlled pedal allows for hands-free operation of this accessory.